Search up a list instead of down! The Find Assistant add-in for Microsoft Excel helps you search up a list! The normal Excel direction is down. Which makes it painful if you want to find the next matching search upward. It is compatible with Microsoft Excel 2007 to 2019 and Office 365. 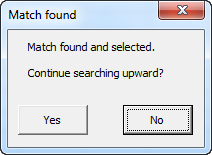 Once a match is found, the following dialog appears. 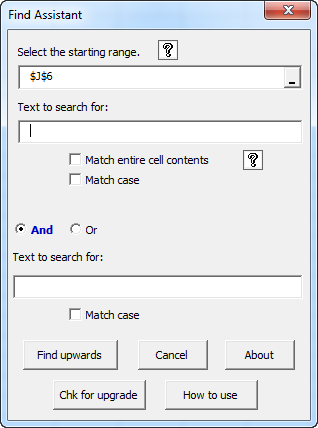 You can edit cells while this dialog is on screen and then when ready, click it to continue the search. You can even change workbooks, do some work, and then click the Yes button to resume the search up the list! The Find Assistant button, , is found on the new Time Savers tab. If you use frequently (which we do! ), just right click on it and add it to Excel's quick access toolbar, for super fast access. Name Splitter - Easily split names into individual cell entries. !